“When I dance, I meditate. When I concentrate on music and the beat, I am disconnected from the rest of the world, I am living it fully with my mind and body.” Thus Prachee Shah describing her state of mind as she performs Kathak, one of India’s most captivating classical dance forms – prior to her Cairo performance. The renowned dancer-turned-actress Prachee performed at Cairo’s Sayed Darwish Theatre on 3 August; her earlier shows in Beni Suef and Alexandria were cancelled due to India’s state mourning following the passing of the former president APJ Abdul Kalam. Cairo’s auditorium was filled to the brim with an audience watching Prachee’s every move, following her footwork, hands and eyes and awestruck by her the spins. In her performance, the dancer addressed the audience on several occasions, explaining elements of the dance and their received meanings in an attempt to bring this art form closer to Egyptians. One of eight recognised classical dance forms in India, Kathak is about telling stories: the word kathak derives from the Sanskrit katha, meaning “story”, and katthaka, meaning “storyteller”. The only classical dance coming from northern India, it has been passed from one generation to the next, with each gharana (family) creating its own repertoire and safeguarding its creative secrets. Prachee follows the school and repertoire set by guru Ganesh Hiralal from Jaipur, Rajasthan, a representative of the seventh generation of the dance. Today in his seventies, Hiralal still performs opposite Prachee, playing harmonium and reciting padhant or “recitation” on stage. 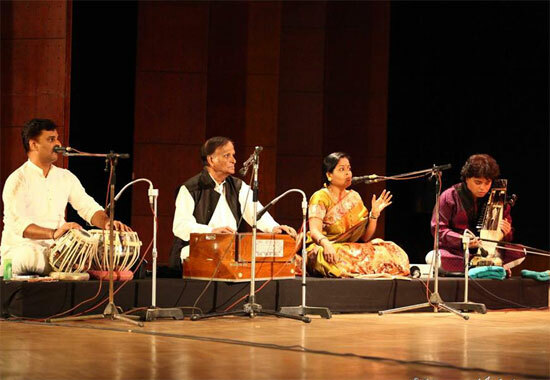 The guru took part in Prachee’s Cairo performance together with other celebrated musicians including Umesh Hasal on tabla, a drum, Farooque Khan on sarangi, a bowed string instrument and singer Sraboni Chaudhuri. Like every Kathak dancer, Prachee wears ghungroos (ankle bells) which produce a sound with every movement. Following the traditional sequence of a Kathak performance, Prachee opened the evening with vandana, an evocation to the elephant-headed god Ganesha, one of Hinduism’s major deities: the lord of beginnings and the remover of obstacles. She then moved onto teentaal, one of the basic taals (rhythmic cycles) of Hindustani music. Consisting of the sixteen-beat sequences divided into the segments of four, teentaal is very symmetrical and the most rhythmically accessible to the ear. “This kind of taal is especially well received by international audiences, due to its very clear rhythmic division,” Prachee explains. Looking at the captivating rhythmic system of Kathak, it is also important to mention bols, India’s mnemonic syllables, pronounced as parts of the padhant in some segments of the performance. In Kathak, the audience is offered a visually and mentally uplifting experience. The music and the dance combine bodily modulation with rhythmic accuracy, playing with one’s mind while touching the heart. With the rhythm being an important aspect of Kathak without challenging the visual side of the performance, this unique aesthetic combination demonstrates the wonders of Indian culture. And while the audience follows the stories and rhythms, the creative segments that Prachee delivers with such ease require an enormous amount of technical ability, motor coordination and concentration. “In Kathak you must concentrate, so the music signals are sent to your mind, and the link between your brain and each part of your body is activated. You need to be focused. This can be reached when you do yoga, meditate, pray, or when you dance… This is when you no longer think about who is watching you, or how many people are in the audience,” Prachee clarified. In our interview, the dancer revealed that though she hails from the family that believes in the values of art, her ancestors did not dance Kathak. “My father wanted me to learn any classical art, not necessarily dance. My parents would ask me what I’d like to practice. I did not point to a specific art form, but instead I always expressed my fascination with Hema Malini, the famous Bharatanatyam [classical] dancer and actress. I wanted to be like her,” Prachee recalls. Prachee’s father enrolled her in Kathak dance lessons close to home in Mumbai. The unique young talent developed fast and the young performer made her stage debut at the tender age of five, immediately earning acclaim. This serious attitude towards dance paid off. As Prachee matured, she kept entering dance competitions, earning first prize in many of them. The winning character was taking India by storm. In 1997, Prachee also entered a beauty contest and won the title of Miss Mumbai. 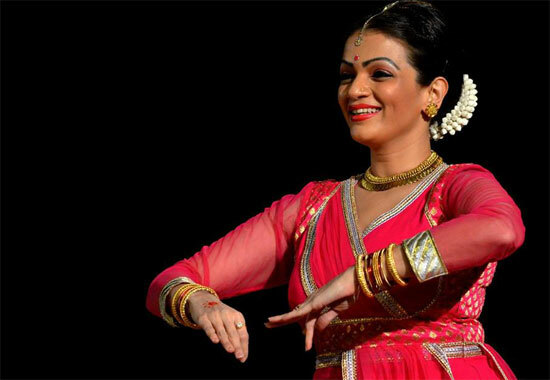 According to Prachee’s resumé, she has also established a Guinness World record, making 93 Kathak spins in one minute. She comments that it is her entry into the film industry that she considers an important stepping stone in her career. “No doubt the title of Miss Mumbai opened many doors to me. Finally, I was a dancer and an actress. I even acted alongside Malini in one of the films,” she describes a dream come true. Today standing at the crossroads between India’s classical art, duly cherished by its gurus and many dancers, and mainstream cinema, Prachee is careful not to let her Kathak be soiled with commercialism. In the modern world, however, many functions of Kathak are being shared with students in India and beyond. Some performers go to the extent of fusing Kathak with other forms of performing arts, presenting shows that at times worry the gurus who value the traditional, intact image of the form. Many artists around the world who practice art professionally find it difficult to sustain decent living. The same goes for Kathak dancers in India. “There are many dancers, and you need to be really good to make it to the limelight and financial stability. While it might be easier for those in small cities where dancers can teach in Kathak institutes or schools, opportunities for professional performances are more limited. 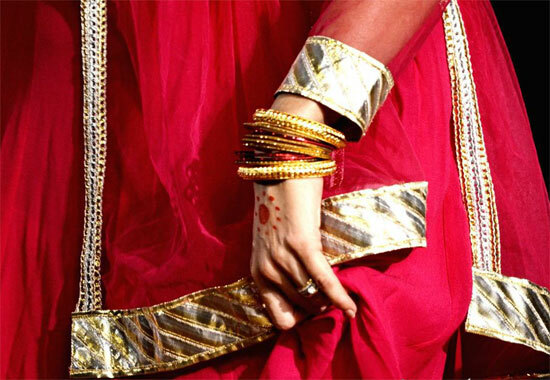 For a Kathak dancer it takes many years to build up a career and to reach a professional level where a dancer is paid. Unless you are exceptionally good at what you do, making it a living can be very tough. Usually teaching becomes your best option,” Prachee says, adding that despite the challenges, many new avenues are opening to Kathak dancers and the world is more and more interested in discovering the many facets of the Indian art. Prachee is among the most fortunate ones and she agrees that, apart from her exceptional talent as a Kathak dancer, her acting career has also played an important role in bringing her to the limelight. Passionate about what she does, she underlines how she enjoys her life. Shifting between many responsibilities that her career and fame have brought along, Prachee remains intriguing on the stage and humble away from the spotlight. Though she has made it into the mainstream world, Prachee repeatedly underlines her strong commitment to Hindustani traditions. “It’s very fortunate to be an Indian,” she concludes. Prachee has given over 200 performances in India, the US, the UK and South Africa. A few years ago, she also performed in Dubai and Abu Dhabi. This was her first visit to Egypt, part of a tour across the Arab world. Though Kathak is no daily bread for the Egyptian audience, it is not completely strange either. In 2014, the renowned Indian Kathak dancer Marami Medhi performed as part of the India by the Nile festival. This time, Prachee’s visit to Egypt is one of the many initiatives of the Indian Embassy and the Maulana Azad Centre for Indian Culture (MACIC). Another recent addition to MACIC’s activities is a Kathak dance course, however: an interesting endeavour that gathered participants interested to explore yet another aspect of India. A visit to the course reveals Maria K., who walks the attendees through basic steps and rhythmic cycles of the dance. “Ta– thei – thei – tat; A – thei – thei – tat…” Maria pronounces the padhant (recitation of technical words of the dance), leading the group through teentaal. She shows the footwork, adds hand movements, then spins… The small choreography slowly emerges to the excitement of the participants who are still confused trying to coordinate all the elements. Maria, patiently, repeats. Born in Moscow, Russia, Maria comes from an artistic family. She studied journalism – specializing in beauty and fitness writing – and paralleled her university years with Kathak dance courses at the Indian Council for Cultural Relations (ICCR) in Moscow with her Russian guru Ekaterina Selivyorstova. “Kathak is about telling a story, it is an ancient form of journalism which only used different means of attracting attention and entertaining people, conveying specific ideas and culture at the same time,” she says, telling me about the conceptual connection she found between journalism and Kathak. But this parallel started becoming challenging and when, still in her 20s, and raising eyebrows, she chose to dedicate herself completely to art. Upon receipt of a scholarship from the ICCR to continue Kathak dance studies under guru Prerana Shrimali of the Jaipur gharana, Maria moved to India. Today she holds a Sangeet Prabhakar degree in Kathak and a three-year certificate in classical Hindustani vocals. Though many begin the study of Kathak as children, Maria’s eight years in the dance allowed her to reach levels that, apart from the certificates, granted her permission from her guru to pass on her knowledge and practice. Maria’s personal life brought her to Egypt where she gave her first Kathak course last year. 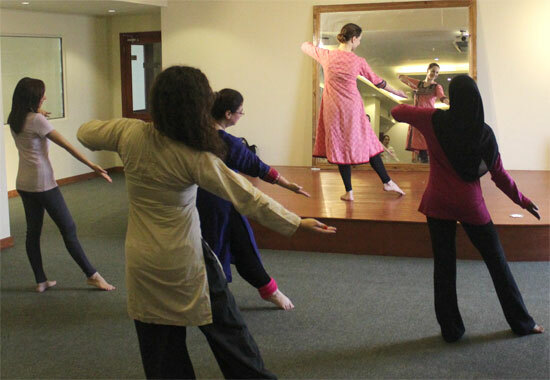 This is the second Kathak course held at MACIC. Yet as we meet later during the day, I discover yet another quality of this dancer and instructor: her ability to tell stories about the dance in a way that draws the listeners even more to this art form. Maria goes on to explain how the Kathak dancer is a conductor of the performance, how he or she leads the musicians into the taal and the choreographed piece. Recalling Marami Medhi’s highly evocative performance and last week’s impressive evening with Prachee Shah and her troupe in Cairo, Maria’s words help to decipher many elements of this art form. “Many segments that are included in a Kathak performance are carried through generations of dancers within the tradition of specific gharanas. Every such piece is like a jewel, an ornament passed from one person to another, and the dancer will sometimes explain the history behind it to the audience during the performance. Formally the guru will never use a piece from another family. I heard that in older times some Kathak tutors did not allow their students to even watch the dancers from other gharanas, to avoid mixing up. This distinction between gharanas is one of the fundamentals of Kathak culture. But today you may see a lot of sharing and merging, and new things are being created within traditional rules,” she elaborates. She explains how the dancer is also a musician, a percussion soloist who uses ankle bells, called ghungroos, which produce certain rhythms. The Egyptian audience could see those two elements very clearly in Prachee’s performance, during which she explained the dance to the audience. In the class Maria begins with the fundamental components of a smaller story, walking the attendees through the technical elements as well as the gestures that create the drama. With her movements she depicts a girl, a flute or a flowing river. With the cultures merging and sharing their wealth, the traditional gurus do not hide their concern about the Kathak’s many meanderings. Many of them refuse fusion, regret the loss of traditional pieces that have become too difficult for the modern audience or frown on turning Kathak into a competition in physical prowess. “Of course the beauty of this dance lies in its many layers. I think that all aspects of the dance have their beauty in a specific time and a specific place,” Maria comments, saying she accepts experimentation and new discoveries which nevertheless do not challenge the purity of the dance itself. Together with her husband, a Cairo-based Russian oud player, she has created Camel Vibes, a musical project fusing contemporary and traditional art forms, with Maria dancing, performing vocals, playing harmonium and tabla and Dimitry Rusi on oud, buzuk, bass, and electronics. One of their performances took place on 8 August at Zamalek’s Elbet Alwan. In a world where everything is being shared and one culture draws on another, Kathak is going through many evolutions. “A foreigner in Indian dance, I am fascinated by its potential as an international art language. It is like chess – anyone can play if he knows the rules. I must say we are having a great time with the Egyptian students at MACIC learning to play Kathak together,” Maria concludes. Whether it is Prachee dancing for the Cairo audience, or Maria revealing bits and pieces of the dance in her course, whether it’s in the heart of India or a creative amalgam of forms presented internationally, Kathak remains one of the many captivating facets of India. Unlike some other classical dances of India, Kathak is supremely dynamic, appealing in its dramatic content, which is probably one of the main reasons behind its unprecedented international success. Yet, there is also this remarkable adaptability of Kathak to the increasing speed of life and growing energy that people expect to see in the performing arts. Above all, however, Kathak is an art that articulates beauty of form and expression. And to best understand the core aesthetics of Kathak one can reach out to Sushil Kumar Saxena, the renowned Indian scholar who in many publications explores Indian music, dance and rhythm. While it takes different forms and lures the audience on many levels, Kathak’s remarkable strength remains in its creative language. Those who are ready to explore its depths will keep searching for its many layers, uncovering an endless world of wonders and beauty. As such, not only is Kathak a dance form, it is also an adventure ground and an incessant exploration of humankind speaking through art.